NBK branches will be open from 10:00 am in the morning till 1:30 pm afternoon during the holy month Ramadan 2016. 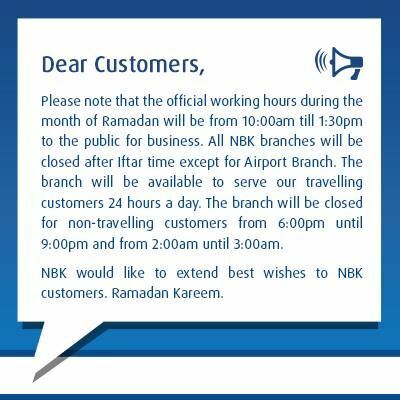 All branches will be closed after Iftar except the airport branch that will serve the travelling customers 24/7. The branch will be closed for non-travelling customers from 6:00 pm until 9:00 pm and from 2:00 am until 3:00 am.